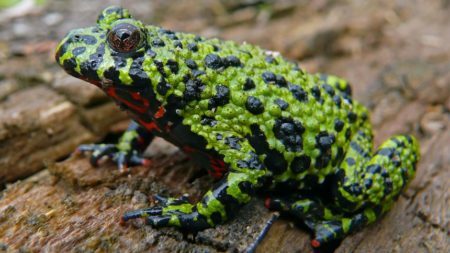 Reptiles like their water, especially amphibians. Adding a waterfall feature to your pet’s terrarium is a great way to increase humidity and keeps water from becoming stagnant. Not only that, it gives the enclosure a more naturalistic appearance. Searching for the perfect waterfall can be fun but time-consuming. So, to save you some time, I’ve reviewed some of my favorite terrarium waterfalls and listed them below. 2 Which is right for me? 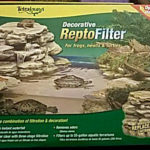 The Tetro ReptoFilter waterfall is ideal for a person who wants a nice looking rock waterfall with very little maintenance. The ReptoFilter is both a waterfall and filtering system. It’s also one of the cheapest decorations online. It’s roughly 11″ x 13″ around and its designed to sit in the corner. Small intake holes are found on the front where water passes through and eventually gets pumped up and out the top. The filters are hidden inside so you only see them when you remove the lid. There are some downsides though, and you can read about them in the full review below. This waterfall is shaped like a natural log. The center is hollowed, which is where the water circulates. It also comes with LED lights! Repti Rapids is definitely a close runner-up! If not for the price, it would be my first pick. It weighs less, includes an LED light and, most importantly, contains all the water within itself. This means you don’t need to make an external water container! 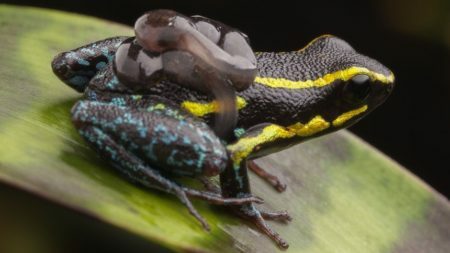 Just place it in your terrarium, add water, plug it in and watch it go. For those of you willing to create your own waterfall, this kit includes the basic items you need to get started. 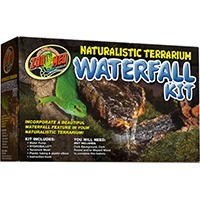 The Naturalistic Terrarium Waterfall Kit from Zoo Med includes a water pump, hydroballs, terrarium mesh, plastic tubing & elbow, and an instruction book. Basically everything you need to get water circulating. It’s up to you, however, to design and buy the other materials you’ll need to finish the job. Things like cork bark, substrate, moss, and rocks are not included. Determining which of these is right for you comes down to a few factors. The first considering is this; do you want to design your own waterfall or do you want something ready-to-use out of the box? Another thing to consider is size. While the waterfalls mentioned above are fairly small, it’s always a good idea to measure first before you buy. The last thing you need to think about is drainage. While the Repti Rapids decoration contains the water you put in it, the other two don’t. The Tetrafauna waterfall needs to be placed in water while the waterfall kit requires the pump to sit in water. In short, you need proper drainage or some type of container to keep the water from flooding your terrarium. Alternatively, using a ‘fogger’, also known as atomizers, is visually appealing and doesn’t require a drainage layer. Click here to see foggers. The Tetrafauna waterfall filter is a steal under $40. 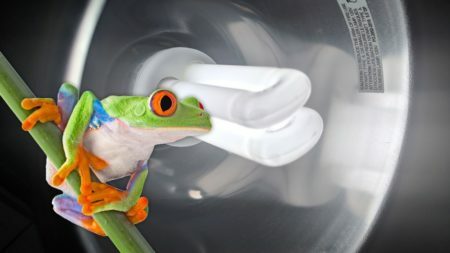 A built-in water filtration device helps keep your frog’s water clean and changing the filter is simple. The folks at Tetrafauna placed the filter inside the rock so you’ll never see it until you remove the lid, which also serves as a small basking area. The lid is easily removed, revealing the changeable filters. This system does have its drawbacks, though. The main one is this; it doesn’t contain water within itself; it is made to sit in water. In fact, the water level needs to be above the intake holes in the bottom or it will not work. Depending on your terrarium, this may or may not be a problem. You either need a drainage layer with a substrate divider or container to keep the water in. Pros – Its cheap, filters the water, easy to use, provides a basking area. Cons – Does not contain the water – drainage layer or separate water container is needed. One last thing I will point out is its shape. Its designed to sit in a corner which might limit your options! Click here to see it on Amazon. Zoo Med has several styles of waterfalls in the Repti Rapids series. The thing I like about them is that all the water is contained within itself. This means you don’t have to create a separate water container. Just place it into your terrarium, fill it with water and plug it in. The LED light is on a separate plugin which allows you to run the waterfall with or without the lights. Two common complaints about these waterfalls are small leaks and noise. Filling the waterfall with too much water results in spills, while not filling it with enough water results in a lot of noise. The reason it becomes so loud is due to a lack of water. Be mindful to check the water level each day and occasionally inspect your Repti Rapids for leaks. Pros – Looks amazing, water is contained within the system, optional LED lights are nice. Cons – Becomes noisy when the water level drops. 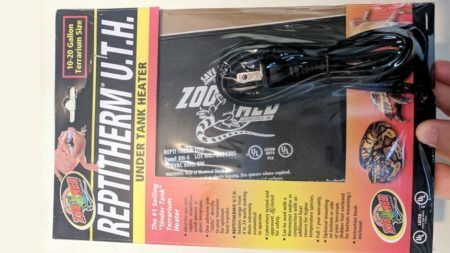 Zoo Med has several styles of Repti Rapids but they’re hard to find online. If you’re interested, I suggest checking your local pet store to see what they have available. As for the version mentioned above, you can find them on Amazon for $50 – $65. The last item on our list comes in the form of a DIY kit. The guys and gals over at Zoo Med have thrown together a package to help you get started. It includes everything you need to get water flowing but leaves the rest up to you! Oh, did I mention it includes an instructional book? Well, it does. Whether you use it or not is entirely up to you but I suggest watching some YouTube tutorials on this topic before buying. The waterfall kit is great, mind you. 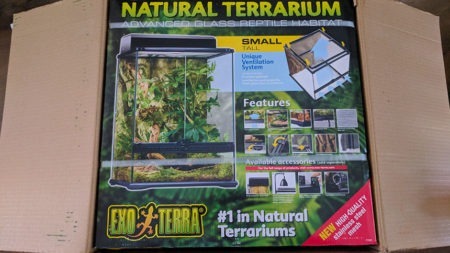 It comes with a water pump, hydroballs, terrarium mesh, tubing and, well, the instruction book. In case you don’t already know, hydroballs are the very bottom; the base layer. Water drains through the substrate, passing through the terrarium mesh and fills the bottom of the tank. Without hydroballs and mesh barrier, your substrate will fall to the bottom and get soaked. 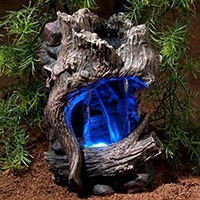 Other things you’ll need are cork bark, Mopani wood, rocks, decorations, etc. Basically, you’re making the waterfall yourself and you want to hide the hose that transfers water from the bottom to the top. Again, before you consider buying the waterfall kit, watching some YouTube videos on how to create a terrarium waterfall! Buying a waterfall feature for your terrarium has its benefits; I think we can all agree on that. As for which one is best for you, well, that’s ultimately your decision. 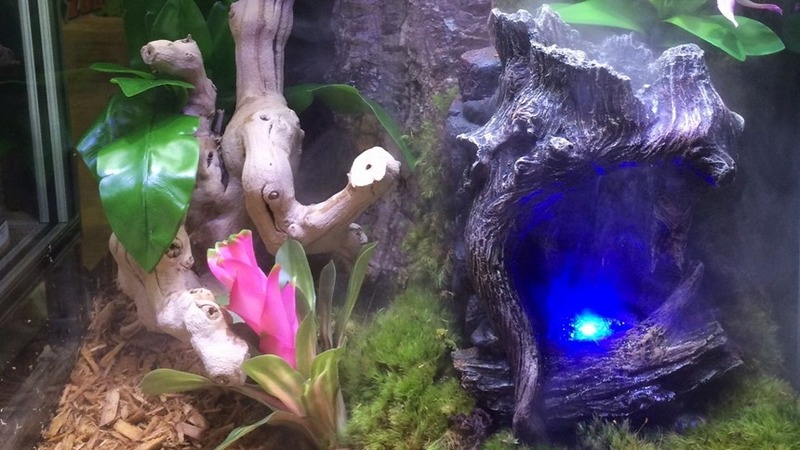 Personally, I’m about to create a naturalistic vivarium for some mossy frogs and I plan to make the waterfall myself, using cork bark, rocks, and other decorations. It’s something I’ll enjoy doing. So for me, I’ll be using a waterfall kit. If you’re not interested in creating your own, that’s okay too. Something like the Tetrafauna waterfall filter or Repti Rapids might be best for you. Remember, the waterfall from Tetrafauna is designed to be placed in a corner and it needs to sit in water. 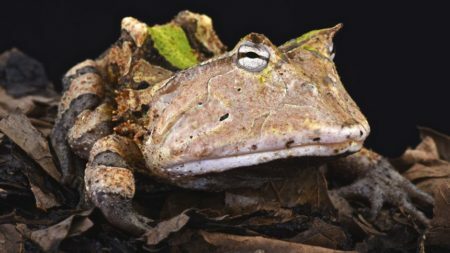 It would be great for frogs that like enclosures with partial water bottoms. But, there’s also the Repti Rapids waterfalls, where all the water is contained within the decoration. Simply place it on your substrate and you’re good to go! Great reviews and I think the zoo med kit seems the way to go but just wondering what size kit would I need for a 45x45x60 vivarium small or medium looks like you would need to buy extra hydro balls do you think. Hey, Gary! Thanks for the kind words! For a 45x45x60 cm vivarium I suggest getting at least 2 bags of hydroballs (maybe even 3). My first vivarium was this size and 1 bag simply wasn’t enough. Also, I ended up not even using hydroballs. I discovered this stuff called matala filter, which is meant for water gardens and koy ponds but works great as a drainage layer. Anyway, if you go with the Zoo Med kit, it comes with some hydroballs but, for the size of your enclosure, you should get 1 extra bag.